By nature, humans love to add to things. Just think about all the objects and knick-knacks that get added to your home. We can’t help but add to things to improve things. Whilst this mindset can be a great innovation technique (adding and combining), it can also sometimes prevent us from the next big breakthrough. A counter intuitive innovative approach is to subtract or 'leave out' a key component in order to innovate. We call this technique elimination. We have found that some of the biggest commercial leaps our clients gain are when they employ the elimination technique. What do we let go of? This is not always as simple as it sounds as many people will think that you are crazy “How on earth can we get rid of that? That’s our key business component!” After asking the first question we then need to ask ourselves “If we had to get rid of this key component, what would need to do to survive and succeed?” Asking this second questions turns it into a challenge and the brain (being an awesome patterning machine) goes about trying to solve it, and more often than not, some incredible innovative ideas appear. I love riding my bike and I just came across a beautiful example of the elimination technique in the bicycle manufacturing industry whilst working in Europe this year. The cycling world is very competitive, and a lucrative market where people are always looking for something lighter, faster and stronger. A Danish company by the name of CeramicSpeed used an elimination mindset to approach innovating around the bicycle. The key component they dared to eliminate was the bicycle chain which enables the cyclist to transfer power from the pedals via a chain to turn an axle and the wheel, enabling you to go forward. What would be the value of eliminating the chain? Despite chains being a useful way of transferring this power and allowing gears to improve efficiency the chains experience high rates of friction and are susceptible to stretch and rust, which requires continual maintenance to maintain high performance. Rather than use the high friction chain, CeramicSpeed in conjunction with the University of Colorado developed a carbon fibre shaft that transfers force via low friction ceramic bearings to the rear cog which reduces friction by 49 percent compared to the market leading chain and derailleur system. 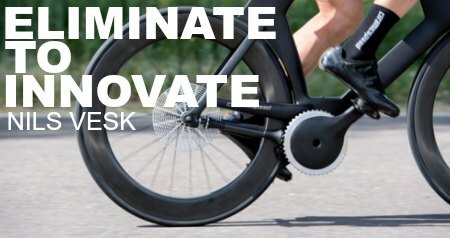 The drive train that they have named “Driven” was part of a prototype bicycle they built to win the 2018 Eurobike Award for the most innovative cycling product. Elimination works as a technique not only in product design. Elimination is very effective for process innovation and service innovation. For example asking the question “what would happen if we eliminated this form that our customers must complete?” is a great way to look for customer service innovation. Ask yourself "what would happen if you had to eliminate it?" If you had to eliminate a step how would you make it work? what would you need to do to survive from this elimination? Are there any ideas or insights you can think of that have been triggered by eliminating one of the steps/ touch points? If you would like to know more about Nils Vesk and his keynote presentations click here to submit your enquiry, or contact us directly on 1300 55 64 69. Ideas are born naked. It’s no wonder so many are shy and never make it into the public eye. As an Innovation Architect Nils takes a stand for ideas. To see them make it, be recognised, and evolve into true innovation. Read more.